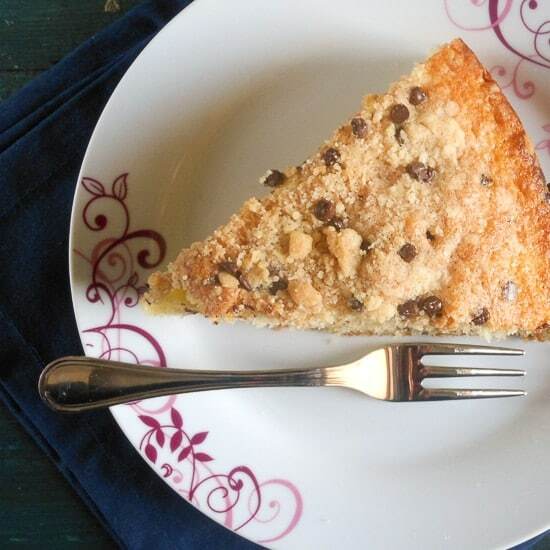 Chocolate Chip Streusel Cake, an easy Cake filled with Chocolate Chips and a delicious Streusel Topping. This Cake is my way of celebrating the fact that I’ve been in Canada for two weeks now and it’s been a wonderful two weeks! I have reconnected with friends in Winnipeg who I haven’t seen in three or four years and it was a pleasure to go back there and see how much has changed since I last saw it more than thirty years ago. One of the best memories I have of my time in Winnipeg is probably the time spent with friends around the table, enjoying delicious perogies made by my friend’s mother. They are probably the best ones I have ever eaten and I always get excited when I think about those! I also enjoyed barbecued ribs, I have a soft spot when it comes to eating ribs, i can never say no! But most of all the company was the best and I miss them already. I hope it won’t take another twenty years for me to go back! After Winnipeg I was off to Toronto, my hometown, and I was ready for the long, awaited graduation of my eldest daughter. How proud we all are of you. It was so amazing seeing her after so long and seeing how she has grown into a beautiful, young woman, full of hope and optimism. We all wish her the best. 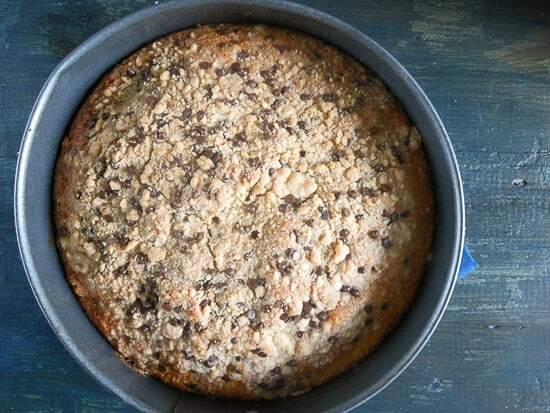 So by now I imagine you are asking what does this Chocolate Chip Cake with a delicious Streusel Topping fit in. 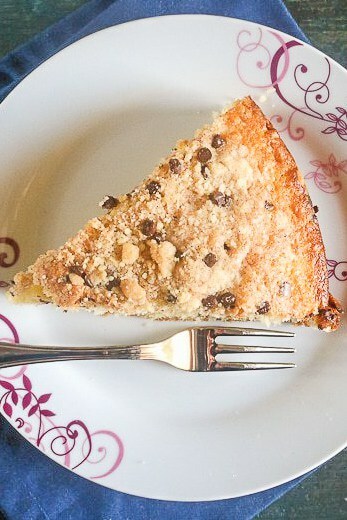 Well we decided to serve a graduation brunch and this cake was the perfect choice, filled with chocolate chips and topped with a delicious crunchy topping. 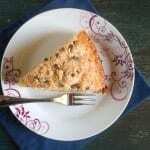 This streusel cake is a great dessert to end a pleasant gathering or in my case a graduation party. Since the summer is here now get cooking and have fun with the people you love! 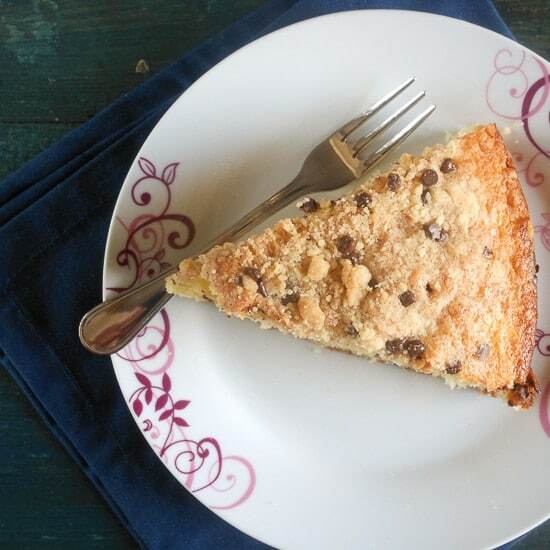 Chocolate Chip Streusel Cake, an easy Cake filled with Chocolate Chips and a delicious Streusel Topping. This Cake is my way of celebrating the fact that I've been in Canada for two weeks now and it's been a wonderful two weeks! 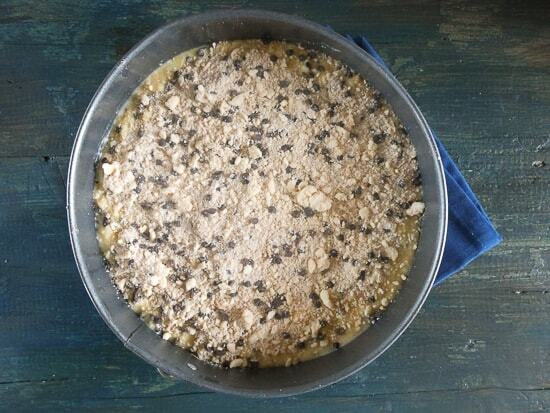 Pre- heat oven to 350° (175°) and prepare a 9" (23 centimeter) cake pan. In a large bowl with a whisk, combine flour, sugar and baking powder, cut in butter and using a pastry blender mix until it becomes crumbly, remove 3/4 cup (100 grams) of this crumbly mixture to a small bowl, stir in the cinnamon (this is your topping). 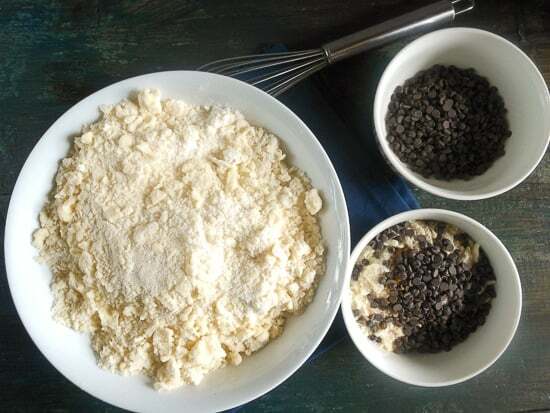 In a medium bowl beat with a fork, the milk, eggs and vanilla until combined (approximately 1 minute) add this mixture to the flour mixture (in the large bowl). Stir just until moistened, gently fold in the chocolate chips. Spoon batter into the cake pan and sprinkle with the topping, bake 45-50 minutes, (check for doneness with a tooth pick. Let cool before serving. Hi Laura, thank you and for sure I will be back to link up. This cake looks delicious! I just found your blog for the first time (through the link party at Katherines Corner). I had a quick look around, and I’ll definitely be back to try some of your recipes! Italian food speaks to my heart. My great grandparents immigrated to America from Italy. I have vague childhood memories of authentic Italian cooking, but my italian grandparents have all passed on, and they took most of their recipes and cooking skills with them. I think I’ll try my hand at a few of your recipes and allow my Italian roots grow a bit :). Hope you have a great day!! Hi Amy, thanks very much, I certainly hope you try your hand at some of these recipes, they are really quite easy and delicious. I learned from one of the best my mother-in-law. So have fun at letting your Italian roots grow. How many eggs go into the wet ingredients??? It doesn’t say in the ingredients list. Hi Jess, thanks, sorry about that it should be 2 eggs, I corrected it, thanks for letting me know. Hi, thanks alot, let me know if you give them a try. Hi Michal, thanks, give it a try I think you will like it.